The conceit of Shitfaced Shakespeare is simple: it's a production of Shakespeare and one of the cast members is shitfaced. 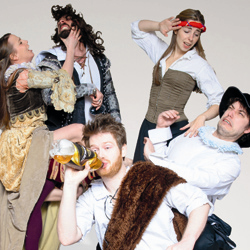 This year they did "Much Ado About Nothing" at the Edinburgh Fringe, and the night I saw it the shitfaced Shakespearean was Beth-Louise Priestley as Hero. I discovered that a drunk Hero staggering her way through Messina is the best thing that has ever happened to this play.